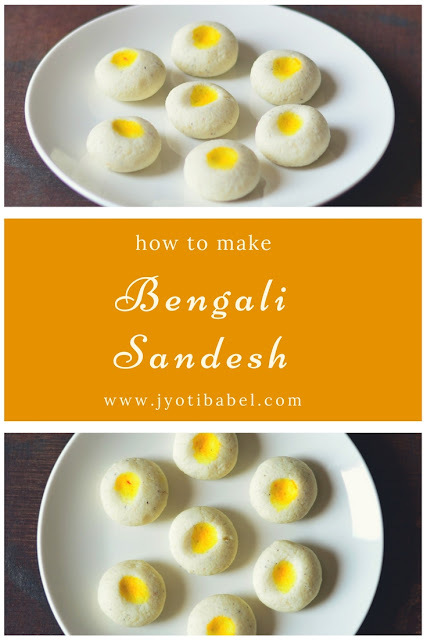 Sandesh or Sondesh, as it is pronounced in Bengali, is a much loved traditional sweet from the state of West Bengal in India. Freshly made paneer or chenna is used in making these. It can be flavoured in many ways. The recipe for Sandesh I am sharing today has been flavoured with cardamom/elaichi and has been garnish with saffron. Bengalis are known for their sweet tooth and hence it comes as a no surprise that the state of West Bengal offers us with a delectable spread of sweet dishes. Misti Doi, Rasogulla, a variety of Sandesh, and many more. There are many ways to make and flavour Sandesh. But one thing is common in all varieties - freshly made paneer or chenna. It can then be sweetened with sugar, jaggery or the Bengal special Noler Gur (Palm Jaggery). Sandesh is often flavoured with cardamom, rose, saffron, etc. Fruit flavoured sandesh like aam sandesh are also popular and so are sandesh flavoured with chocolate. Kneading the freshly made paneer is very important to get a smooth texture. Typically, once sugar and fresh paneer are kneaded together, the mixture is cooked on low flame for 10-12 minutes. It can also be steamed - in that case it will be called Bhapa Sandesh. But, today the recipe I am sharing for Sandesh is the simplest ever. I have not cooked or steamed the mixture as I was feeling lazy to work in the kitchen. Maybe I will do it later when the weather is a bit cooler than it is now. 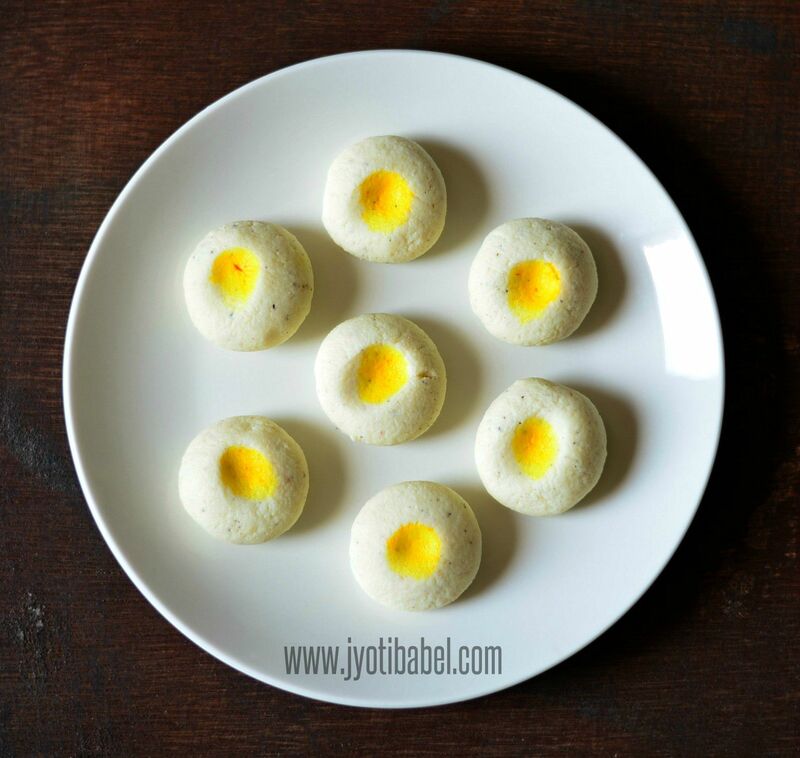 Let's check out the recipe for my simple cardamom and saffron flavoured sandesh. 1. Strain the freshly made paneer using a muslin cloth. Let all the whey drain out from the paneer. It may take about an hour or so for you to get a soft paneer ball. Make sure it is not too dry else the sandesh ball will crumble. 2. Take the paneer on a large plate or paraat and add sugar using the edge of your palm, knead for 8-10 minutes. Add cardamom and knead for another minute or two. 3. The mixture is ready when you start getting smooth balls out of it. If there are cracks on the surface, it needs to be kneaded more. 4. At this point, you can cook this mixture in a non-stick kadhai. The mixture will soften first and after 10 minutes, the moisture will evaporate. When it cools down a bit and you can handle it, make small balls of sandesh. I didn't cook it and made small balls of the mixture. 5. Garnish with a spot of saffron and keep them in the fridge to chill. 6. Pop one into your mouth and enjoy it. 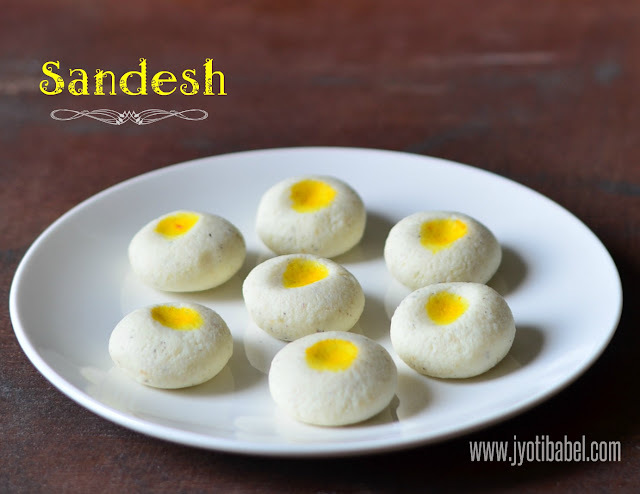 These Bengali Sandesh are my entry for BM#86 Week 2 Day #3 under the theme - 'Festivals/ Occasions'. For Day #1 I had shared this Kesar Phirni Recipe and for Day #2 I had shared a Whole Wheat Papdi Recipe. I love sweets in general but Bengali sweets are my all time favorite. The Sondesh looks very tempting and wouldn't mind gobbling up a few. Wow the Sandesh have turned out so well . This Bangla dessert is so versatile, I literally went crazy at Kolkata airport seeing such a huge variety of sandesh . Sondesh is my favorite Bengali mithai and this looks so sinful with saffron color popping put in the centre. I love both the cooked and uncooked variations of sandesh. You have made it so good and beautiful presentation.. These sandesh looking awesome, very inviting. drooling over them wish if I could grab them some. How pretty and damn cute those Sandesh looks. Please give me that plate, i want to finish rite now. Am just drooling over those cute Sandesh. Sondesh looks so creamy and delicious. You have made them so perfectly. They look like they will just melt in the mouth. so beautifully done jyoti! looks so neat and cute! that saffron center makes it more attractive!!! Awesome. My favorite sweet and those look gorgeous and the color combination is simply inviting and making me drool. Sondesh looks so yummy and love that shape!.. wow so cute looking sandesh they are .. I would just sit and adore them for hours before indulging them :D perfectly made and shaped jyoti !! Sandesh has turned out perfect. Saffron garnish is very inviting and tempting.